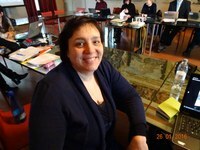 Paola Salomoni is an Associate Professor of Computer Science at the Department of Computer Science and Engineering of the University of Bologna. Since 2008, she has been collaborating with the Inclusive Design Research Centre – Ontario College of Art and Design, Toronto, Ontario, Canada in projects related to e-learning technologies. Since 2007 she has been involved in UNIBO E-Learning Centre activities as an e-learning expert. Thanks to her expertise in e-learning technologies, she has been involved in the following projects: E-LOCAL, E-LOCAL for all and RESINT.